Manage your business documents and collaborate efficiently with colleagues, tax and legal advisors, investors or consultants. Enter your email address to download our free whitepaper ‘The augmented sales’ team. Spending to much time organizing your documents? customers generate cost and time savings. visibility and accountability and reduce risk. with their own Worklean workspaces. Store all your business documents in one place – with the highest security. Smart search and filters help you find documents quickly and efficiently. 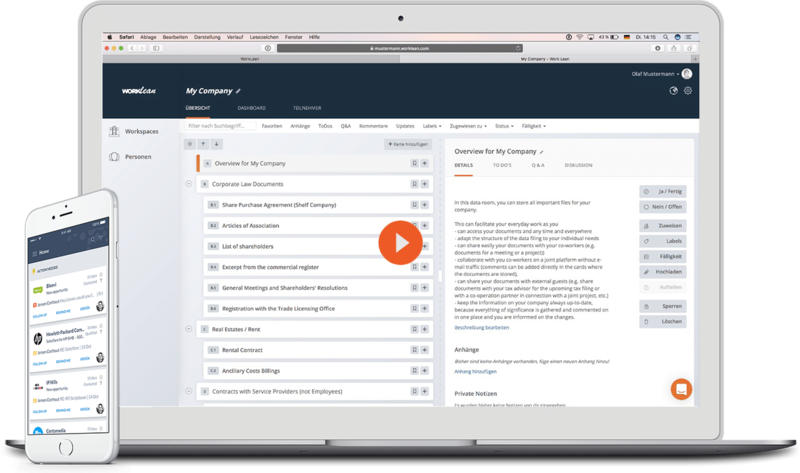 Smart workflows and checklists provide transparent ways to work together in an easier and faster way. Import folders and documents from your local drive or cloud storage (Dropbox, Box, Google Drive) or any other data room. Build your data room for Due Diligence and M&A processes. Dashboards and analytical tools provide transparency and accountability.